Tommie Harris: Not a fan of the media. We think. After a 45-10 win, a feud between Lovie Smith and Tommie Harris is the last thing the Bears need. It appears to be happening anyway. Two days after Harris didn't play in the Bears' Sunday disaster, questions over why Harris was benched still linger. Bears GM Jerry Angelo said last week that Harris was healthy, but then Harris didn't practice all week, and he was nowhere to be found on Sunday. When Smith explained Harris's absence, he blamed it on "soreness." Harris immediately refuted Smith to the media and claim that he was healthy. And if none of this seems to make any sense, don't worry: We're just as confused as you. The likely explanation is that Harris took off more than his customary number of practices this week -- he didn't practice once -- and still expected to play. And when Smith benched Harris, Harris was angry, and decided not to toe the company line to the press. And so here we are. The problem with Tommie Harris is that this isn't his first problem. 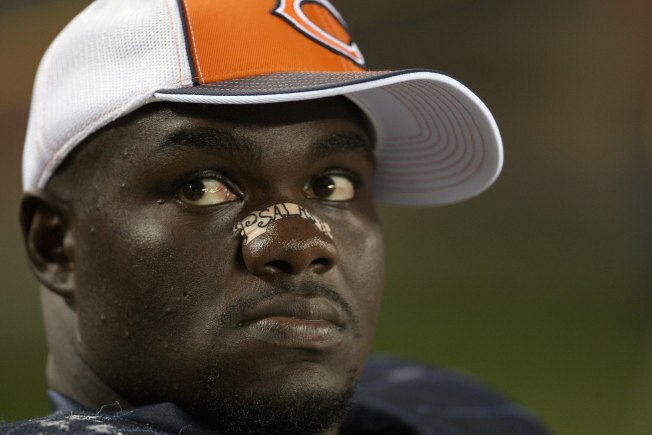 Harris was suspended for verbally sparring with Lovie Smith in 2008. He weirdly lashed out at the media not long after. He's constantly injured, to the point where it's normal for him to miss nearly every practice each week. Last year, David Haugh reported a scout saying that Harris's body was the equivalent of a 35-year-old's, and even though a weak Harris is still a top-flight defensive tackle, he would be an injury mess for the rest of his career. The Bears rewarded Harris with a $40 million extension in 2008, so they have only themselves to blame, but still, it's a shame. Harris is one of the most talented defensive tackles to the enter the NFL in a decade. Even injured, Harris is a solid player. But constant sniping at your head coach -- of all people, Lovie Smith, a guy who regularly takes guff for being too nice to his players -- isn't just dumb. It's borderline self-destructive.